Well it’s the end of July and this is my final piece. It has been a pleasure. I hope my articles during the period April 2006 to date have been of interest. It is sad for me knowing that it’s ending, but it has to be; if you wish to gauge the level of my sadness Google into – Time to say goodbye: Andrea Bocelli and Sarah Brightman do a good job for me. So what is the ‘But’ in the article heading? Well I can tell you there is a major hope of a big boost to the site’s collection of photographs; in a bedroom in Brandon there are potentially hundreds of photographs of Ushaw Moor, from the 50s, taken by my uncle Norman. If that is the case, and it may well be so, I will make an effort to get anything appropriate onto the site – even if it takes years rather than months to achieve it. I was amazed upon receiving my ticket for the Durham v Derbyshire 20/20 cricket match to find that Durham were playing what they called the ‘Derbyshire Falcons’. Everyone knows that the away side were the Derbyshire Phantoms [much more threatening and mysterious]. 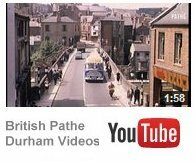 No – everyone got it right but me: seemingly I was the only one not to be aware that Derbyshire had changed their name yet again. Falcons? Where did they get that name from? This episode is so embarrassing; I even told a women on a big red bus that ‘Durham have got it wrong you know’. I even said to the man that inspected my ticket ”Derbyshire will not like this”. He asked for an explanation, which I gave, and he looked puzzled. It got worse – they even put up Durham v Derbyshire Falcons on the big screen at the ground – do they never learn? No it was me, bigoted know all me, behind the times yet again. I was in Ushaw Moor Cemetery, with a family friend, looking for John Thomas Hope [number 2 in the all-time Magnificant 7 list of great Ushaw Moorites] and duly found him. But we could not find my grandparents; this failure has happened twice now – where on earth are they buried? Talk about weird happenings down at the cemetery.Upturned coffin, graves that move, eight empty plastic milk bottles strewn around the area just inside the cemetery entrance etc. Most disheartening. Then a strange thing happened, but it is nothing to get frightened about, just a case of wild co-incidence. We got talking to two women that were also doing some family history work and in passing I discovered that a relative of one of them lives about one hundred yards from me in Surrey! And they are linked to me by way of the Hodgsons – if you remember Arthur Hodgson married my aunty Ethel! Blow me away I thought. I enjoyed a ‘proper’ cup of coffee at the little cafe, on the left hand side of the cathedral green, but I was too early for one of their delicious scones; they were still at the dough stage. Anyway, I then went to the loo nearby for a wee and found a water leak [not mine]. It was leaking at the rate of one drop per three seconds. You might say that is nothing to worry about but I say that cathedral has been there for a very long time; if that leak continues for the next thousand years, at one drop per three seconds, that is a lot of water. Have a look for yourself when you next visit. If necessary report it, if you have any remaining time after spending so much of it estimating the total water loss after a thousand years. On the way back home I was on the escalator going up to Kings Cross railway station when a man, he was strongly built and must have been 6 feet 2 inches in height, passed me on my left on a parallel escalator that was going in the same direction. He was noisy and seemingly troubled – speaking a very loud [to no one in particular] mixture of nonsensical English and what seemed like aggressive German. A women in front of me was looking over at him with an amused look on her face and at the time I did not think that was appropriate; afterall I could see that they were going to meet at the top and then what? It is an incident that has stuck in my memory. Bearpark were unlucky not to win their FA Amateur Cup fixture at Hartlepool RA. The efforts of Hartlepool RA to play class football baulked against a quick tackling Bearpark defence. Wilson, the Bearpark centre half, and Robson were especially good. In one incident Wilson kicked the ball off the goal line with Minnis out of his goal. Bearpark began to press and were rewarded with a goal from Carr after 25 minutes. Carr missed a penalty for Bearpark in the second half and Harlepool RA’s inside left equalised with only ten minutes to go. Final Score 1-1. Minnis, Blakeburn, Nelson, Graham, Wilson, Robson, Patterson, Carr, Hurst, Ainsley, Brown. Reserve Cummings. That must have been some game! After the game the league positions were as follows: Top Waterhouses [five wins one draw], Quarrington Hill [three wins one draw one defeat], New Brancepeth YC [three wins one draw one defeat] Sherburn Village [three wins two defeats], Hamsteels BC one win one draw three defeats], Ushaw Moor one win three defeats], Bowburn BC [one win four defeats] and bottom were Broompark – but with games in hand – [three straight defeats]. I guess that YC is short for Youth Club, BC is short for Boys’ Club, and SSC is short for Sports and Social Club. There were some mixed fortunes in this month. The Moor put in a good performance against Crook in a midweek fixture that attracted a gate of 1,700. In the first half, despite a stiff breeze and the sun, they had the better of the exchanges and at half-time they found themselves leading 2-1. It was McAdam of Ushaw Moor that had scored the first goal of the game and although Wake equalised for Crook, Nicholson replied for the Moor only a couple of minutes later with a goal from a penalty. Wood scored another for the Moor after 60 minutes to make in 3-1. Crook, who afterall were a Northern League team, turned up the heat in an exciting period of the game but could only add one further goal [from Weston]. Final score Ushaw Moor 3 Crook 2. Tommy Sharpe was described as outstanding at full back for Ushaw Moor and keeper Smith made some outstanding saves in the Moor goal. Waterson and Hailes played well in the Moor middle line but the Moor forward Finlay was their only forward of note on the day. Ushaw Moor were described as inept in their league game against Trimdon Grange and deservedly suffered their first home defeat to a better organised team. The non appearance of the referee delayed the match by 20 minutes and in the end Tom Freeman [ex Middlesborough and Durham City full back] took over the whistle. Half-time Ushaw Moor 0 Trimdon Grange 1. Full-time Ushaw Moor 2 Trimdon Grange 3. It was Wood and Wilson that netted for Ushaw Moor. Coulston made his debut in goal for the Moor and pulled of some fine saves. Hailes did ok at right half. This defeat was only the Moor’s second in ten games – not so bad! Smith, Lockey, Sharp, Hailes, Waterson, Richardson, Gleghorn, Wood, Finley [or Nicholson if Finlay fails a fitness test], James, McAdam. New Brancepeth Colliery Band would be playing during the interval. J Ronson, J Hanson, J Gilbert, R Richardson, J Easter, N Kelly, D Kemp, G Pearson, F Shevels, S Kelly, J Tolley, Reserves – R Lee and A Ross. The weather for the Durham Miner’s Gala of 1950 was a bit dodgy. There was some fairly heavy rain before mid-day and it made some people a bit anxious for the event. Some of them went home and gave it up. Later the rain held off only for it to return at about 8.30 pm. Lots of pretty dresses and new suits got soaked but many people refused to be down hearted about the conditions and enjoyed themselves anyway! Ushaw Moor Cricket Club got its first league win of the 1950 season by beating Craghead. At the time the Moor were second off bottom and Craghead were below them so it was not much to bugle about… In fact Ushaw Moor’s league record as a result of that win was Won 1 Drawn 5 Lost 12. 1950 was the year of Lancelot Hill’s funeral. He had reached 54 years of age. In his time he had played cricket for both New Brancepeth and Esh Winning, as well as briefly holding the job of secretary of Ushaw Moor Working Men’s Club. That is that for microfiche and now I want to move on to my matchday experience of Ushaw Moor v Langley Park held, not in 1950, but on 17/7/2010! The weather was not bad. It was sunny although darkish clouds threatened to move from a position above what would have been New Brancepeth Pit and plonk themselves directly over Ushaw Moor’s cricket pitch. In the event the weather was all talk and never moved at all. Speaking of movement I saw no evidence of Langley Park’s opening bowlers achieving movement. They were straight up and down. David Jones, the young lad bowling from the Station Road end, was in my view medium fast; that would have been ok but unfortunately he failed to get any swing and too often failed to force the openers to play the ball early on. There were one too many full tosses from him. I had sympathy for this young bowler and told him so said when, at the end of an over, he drank water from the boundary near the the seat I occupied. My sympathy was felt because of the uneven and slightly downhill pitch he had to negotiate as he ran in to bowl. His opening bowling partner was probably deserving of the accolade fast bowler and sometimes got some lift out of the pitch; in my younger days I would have found one or two of his deliveries a bit awkward to negotiate. To me the Ushaw Moor professional batsman looked good, whilst he was at the wicket, but this had not been his season for meaningful runs – so far -however there is still just about enough time for him to make an impression on the committee! At one point I retired to the bar for a pint and an opportunity to view the team photographs of yesteryear. It was a bit strange to see a picture of my lovely grandad looking so young. I could see that it was Mr Richard Wallace Hope but he was destined to put a few pounds on like all of us! Then it happened. I asked Adrian the barman to tell me who the man was sitting on a scooter at the bottom end of the pitch, well behind the boundary line. When he told me that it was Alfie Gillespie [thanks to Adrian for correcting my errors relating to Alfie including my ‘Harry Gillespie’ typo] I could not believe my luck. I had heard so much about him from my uncle Norman Hope. Alfie was a lovely batsman – technically correct and reluctant to hit the ball in the air [although Bradman was in a different league he had the same philosophy as Alfie]. I went over to talk to him and he very kindly agreed to a chat. He is now in his 89th year and a bit deaf but his brain is still sharp. Alfie suffered a bad injury whilst fielding on the boundary [bottom end of the boundary – graveyard end]. It very nearly was graveyard for Alfie because as soon as the pints of blood were pumped into him he needed more! It was an unexpected pleasure to meet the great man and I will never forget it. As our chat was coming to an end he pointed to two gentlemen standing about forty five yards away near the boundary slightly to our right and he named them: Raymond Ayre and Frank Procter! I enjoyed a chat with them and they showed me great consideration. Brilliant stuff. If my memory serves me right Mr Proctor informed me that it was his boundary shot that had accidentally hit Alfie all those years ago! So Alfie must have been behind the boundary and watching his colleagues bat. I had several afternoon meals at Cafe Neenas’ in Chester-Le-Street. It has a lovely atmosphere, the meals are generously portioned and the prices are reasonable. The customers I came across were interesting worthies; no doubt they all have a story to tell and given more time I may well have heard those stories in more detail! I popped in and saw John and Elsie Vasey on the last day of my holiday and enjoyed their company, even though it was not for as long as I would have liked. They have a history of hard work and consideration for other people and those are values not to be dismissed lightly. Well that was 3 of 3 but there is one more article to complete [as soon as I can] and it is a bit about Ushaw Moor Football Club of 1950 vintage. Back to the microfiche – back to 1950. Ushaw Moor Youth Club did very well that year and deservedly won the Durham Table Tennis League Cup. The team consisted of William Jackson, George March, Frank Proctor, Joseph Young, Arthur Snaith and Albert Snaith. Vicar Welby conducted the funeral of Mrs H Sokell of Durham Road. Chief mourners included:her sisters Mrs A. T. Thompson and Miss Brynn [or perhaps Brym or similiar – my record at this point is not good – apologies] Mr and Mrs T. E. Sokell [brother and sister in law] Mr T. F. Fothergill, Mr and Mrs G. E. Bryan, Mr and Mrs Bradnick and Mrs Beasley. A Miss Street and Mr F. Bell married at the Durham Road Methodist Church. The wedding picture shows twelve people including two young bridesmaids. There is a big advert with the message ‘Nobody had much fun when I was around – I was always full of Neuritis’. It was an advert for a brand of laxative salt. I liked the ‘pass me the Paddy and I’ll show you the way to wash up’ advert. It was a speciality of the CWS soap works. Sedgefield were reported to be all out for 106 [W Brass 4-34 and J Towns 3-50]. I checked the report three times – there is a problem and I will leave it with you! Continuing with 1950 Esh Winning has been named by the Ministry of Health as having the most ideal housing scheme in the North of England – the architect being Mr Fred Hedley, a local man from Brandon. He felt that people, especially miners, need a degree of sunshine. As a result of success in an essay, organised by the National Union of Miners, councillor R. J. Meldrum and Mr J. Charlton are to attend the Summer School in Edinburgh. Ushaw Moor colliery houses demolished – running north and west.